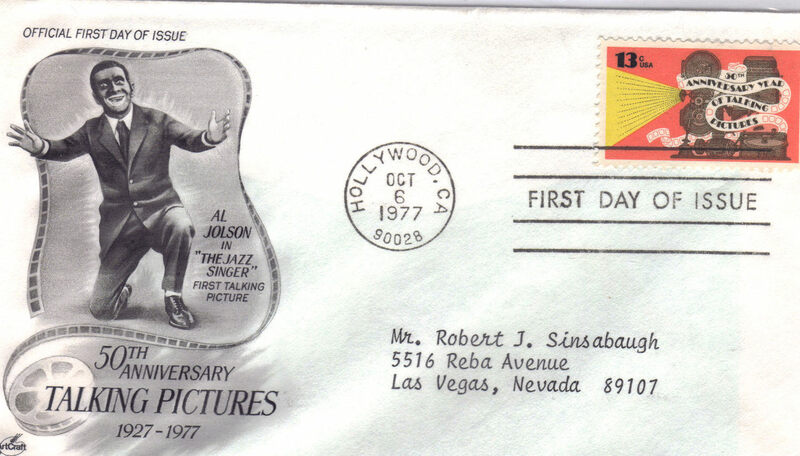 This is an exclusive limited edition commemorative cover producted by the Israel Stamp Collector's Society or The International Stamp Coin Collectors Society Comemorating the 50th Anniversary of Talking Pictures 1927 - 1977 featuring AL JOLSON in "THE JAZZ SINGER" The First Talking Picture 1927. After the attack on Pearl Harbor, Jolson became the 1st star to entertain troops overseas during WWII and again in 1950, became the 1st star to perform for GIs in Korea, doing 42 shows in 16 days. Jolson was to jazz, blues ragtime what Elvis Presley was to rock 'n;roll. Being the 1st popular singer to make a spectacular 'event' out of singing a song, he became a 'rock star' before the dawn of rock music. he enjoyed performing in blackface makeup - a theatrical convention since the mid-q19th century, he is credited with single-handedly introducing African-American music to white audiences. Measures 6-1/2" L x 3-5/8" H Mint condition Send email if you need additional details. Buyer is responsible for 1.95 shipping to anywhere in the USA Canada. Do check the store for many more Las Vegas Collectibles daily. Thanks for stopping by!